(AFP) - Nations on Sunday struck a deal to breathe life into the landmark 2015 Paris climate treaty after marathon UN talks that failed to match the ambition the world's most vulnerable countries need to avert dangerous global warming. "Putting together the Paris agreement work programme is a big responsibility," said COP24 president Michal Kurtyka as he gavelled through the deal after talks in Poland that ran deep into overtime. Egyptian ambassador Wael Aboulmagd, chair of the developing nations G77 plus China negotiating bloc, said the rule book saw the "urgent adaptation needs of developing countries relegated to a second-class status." French President Emmanuel Macron, who has recently backed down on anti-pollution fuel tax hikes in the face of country-wide "yellow vest" protests, said France must "show the way" as he welcomed the progress made at the talks. Developing nations had wanted more clarity from richer ones over how the future climate fight will be funded and pushed for so-called "loss and damage" measures. Another contentious issue was the integrity of carbon markets, looking ahead to the day when the patchwork of distinct exchanges -- in China, the Europe Union, parts of the United States -- may be joined up in a global system. 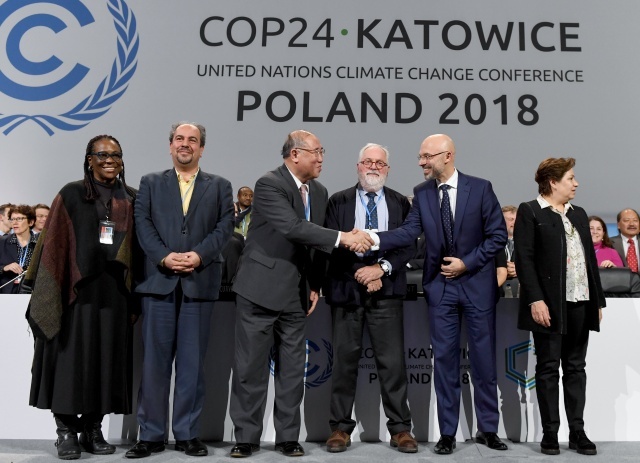 One veteran observer told AFP that Poland's presidency at COP24 had left many countries out of the process and presented at-risk nations with a "take it or leave it" deal. "There's been a shocking lack of response to the 1.5 report," Greenpeace's Morgan, told AFP. "We are organising for repeated disruption, and we are targeting our governments, calling for the system change needed to deal with the crisis that we are facing."